Live, and Just a Swipe Away — It's 40 Years of Saturday Night Live! Everyone can name their favorite SNL sketch. But how do you track it down when you’re craving a dose of comedic relief? 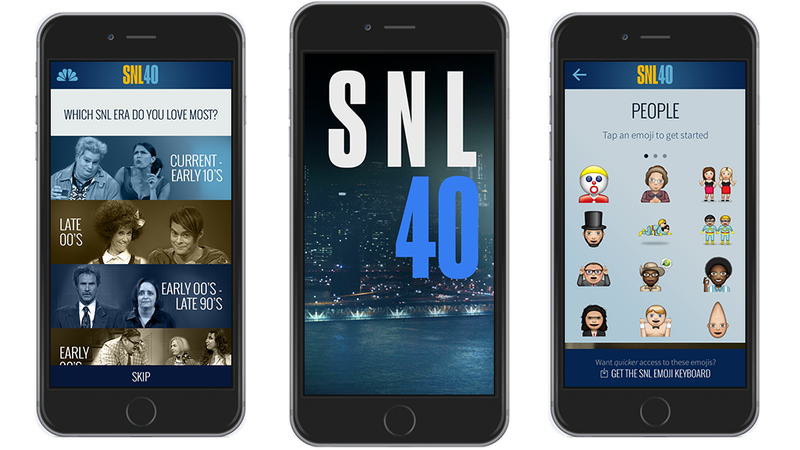 To celebrate the show’s 40th anniversary, NBC and SNL executives wanted to create a new way for fans to find their favorite moments (among the 5,500 sketches produced!) and discover new ones. They enlisted MarkLogic’s flexible Enterprise NoSQL technology, and, voila! — fans are now instantly able to interact with a gold mine of SNL data via a unique and engaging app. With data rapidly growing in complexity and variety, many major entertainment organizations find themselves having to say no to projects that involve large amounts of incredibly complex data. NBC was determined to overcome this hurdle. Their main goal for the app was to encourage users to binge on the content, or, as SVP of Product, Technology and Operations at NBC Entertainment, Michael Martin puts it, “make a meal out of snacks.” It may be easy to encourage viewers to binge on full episodes in a series, but those standard tools didn’t work for SNL’s range of individual sketches. “If we could find a way to unlock bingeing by providing a targeted stream of SNL sketches perfectly attuned to an individual’s interests, then there was incredible untapped potential to serve the nation of SNL fans,” says Martin. They needed a system that could hold a user’s attention and predict a followup sketch that would compel them to keep watching when their current video ended. Not only that, it would have to revise that prediction in real time using sketch metadata attributes. “Even with an amazingly fun navigation UX, the user is gone after only a few mis-targeted sketches,” says Martin. “That requires a massive amount of extremely granular metadata and robust tool to manage and mine it.” Enter MarkLogic’s NoSQL technology and its capacity to speed up heterogeneous data integration and achieve dynamic content delivery at a massive scale. NBC needed flexible and dynamic technology, and they found just that in the NoSQL database from MarkLogic. Its ability to combine advanced search features with semantics without requiring that data conform to a specific structure made it uniquely suited for NBC’s goals. “For users with a specific sketch in mind, the rich metadata model powers an amazingly accurate and comprehensive search function,” says Martin. NoSQL’s flexibility allowed the data team to include every possible nugget of data connected to a sketch — whether a recurring character, location, cast member, special guest, time period, and so on. Another issue was the idea of a “golden age” of SNL. Depending on your generation, you might consider Dan Aykroyd and Bill Murray as the “golden age” cast members. A younger fan might veer toward the Will Ferrell and Cheri Oteri years. By leveraging MarkLogic’s agile data structure and semantics, the app avoids making assumptions about the user’s preferences. Instead, it builds on the user’s choices to determine what video to show next. In technical terms, this “smart content” can discern users who search for Alec Baldwin as the special guest will most likely be interested in his “Schweddy Balls” sketch with Ana Gasteyer and Molly Shannon. Most SNL fans have favorite cast members and characters that they can happily watch over and over...and over again. But many sketches are just waiting to be discovered. To solve the problem of point of entry, the NBC team developed a strong predictive semantic engine rather than relying on the user’s search query. “We brought in a large team of subject matter experts, solely dedicated to the task of re-cataloging the entire SNL sketch library,” says Martin. “They populated a massive semantic data model which reflected the users’ mental model of SNL based on the audience research.” MarkLogic’s NoSQL technology was used to build the massive data repository that is mined by predictive analytics while the app is in use. Inside the app, a video will play automatically and encourage users to swipe forward or backward to other related videos. MarkLogic keeps records of all the data associated with individual sketches and incorporates a user’s anonymized activity to create dynamic personalized recommendations. The user is guided toward sketches the app knows it will appreciate, and suggests sketches the user may have never seen. In other words, the app learns if you need more cowbell, or if you love it you love it you love it. If you would prefer to do your own exploring, you can browse by cast member or season. The app also features a social aspect, asking users to choose a character emoji (obvious choice: Tim Meadows’ Ladies’ Man), and encouraging them to save and share favorite sketches. When he spoke at the Hollywood IT Summit in May, Martin discussed the app’s success: Viewers all over the world had watched more than 100 million videos, and spent more time with the content, in a fully immersive watching experience. If MarkLogic’s smart content can organize a data pool as large as 40 years of SNL, with signifiers and queries as unique as its users, the possibilities for other types of data collection seem endless. Gone are the days of frustrating online searches to find that video clip you’re dying to show your friends, or the name of the actor from an obscure film you love. MarkLogic’s Enterprise NoSQL data retrieval technology is one step ahead of you. Jessica Ferri is a writer based in Brooklyn. You can find her at jessicaferri.com. This post is a sponsored collaboration between MarkLogic and Studio@Gawker.